One particular IRCFG member, John Lomax, who is Chair of the International Committee of Swansea Rotary Club, was especially taken with the work the local club has done at 'Bonniepeople' (the cr�che serving the squatter camp at Bonnievale). He hinted that Swansea might be interested in supporting any future Bonniepeople projects by partnering our club in a matching grant. The caravanners were also very impressed by the number of projects our young BRW Rotary Club had undertaken! David Hall was BRWRC President at the time and he kept in touch with John over the next two years. During this time a matching grant proposal was developed by BRW RC to fund a literacy project among children in their first 3 years at school. It was to be undertaken in collaboration with the Cape Town based NGO �WordWorks� and had the approval of the Department of Education. The project would include children and their parents from the Bonnievale squatter camp as well as children from other areas in our valley. The Swansea club agreed to be a matching grant partner for this project and announced that they would organise a concert as part of the fundraising. 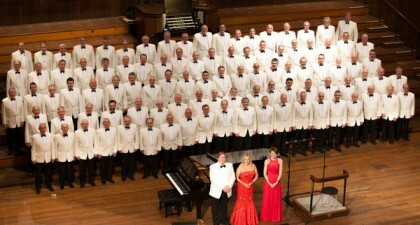 The concert took place on June 29th 2013 at St Mary�s, the parish church of Swansea, situated in the city centre. It was a choral performance by the Morriston Orpheus Male Voice Choir and the Ariosa Singers.